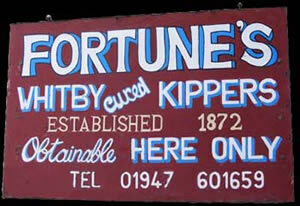 In 1872 William Fortune founded the famous Fortune’s smokehouse in Whitby. The smokehouse still in its original Henrietta Street location has been passed down through the family, so that today it is run by the fifth generation of the Fortune family. William’s son Martin worked in the smokehouse and also ran the donkey rides on Whitby’s beautiful sandy beaches, which he inherited from his mother Jane. Martin married Ellen, who helped her husband with packing the kippers which were sold to customers outside the shop and smokehouse. The kippers were packed into little wooden boxes ready to be sent by train all over the country. Ellen can be seen outside the Henrietta Street shop with a sign advertising postage from 2/- per box. The sign above the door reads: “Direct from curing house to consumer sent your friend a box at the following cheap rate…” The sign on the table offers 6 pairs of kippers sent by parcel post for 2/-, that’s the equivalent today of 10p for 6 pairs of kippers including postage!